My blog is still fairly new, just a baby really. I started this blog just 3 months ago, so I was shocked when I got an email from Kim over at Today's Creative Blog informing me that I was featured today. I blushed when I read all of the nice things she wrote about me and had to read it a few times to be sure she was writing about my little blog. I was looking at her list of blogs she has featured and it is a good sized list of some really great blogs. If you are looking for some good blogs to read, go visit her site. Congratulations! You must a pretty neat blog to get noticed so quickly. Cute blog design, too! 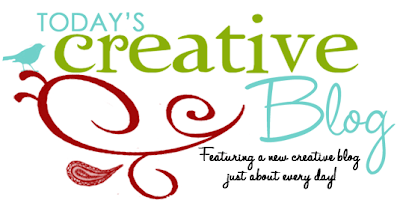 Today's Creative blog led me to you today! I love it, I will definitely be by often. Do you live in SLC? We were just out there visiting in June, we had a blast there. Just visiting from TCB. I love all things thrifty too! I'll add you to my blog list! Look at all the TCB comments. Makes my heart warm. Hey, I just clicked over from there. I really like your blog!